NASA’s Juno Mission reveals massive amounts of energy swirling over Jupiter’s polar regions that contribute to the giant planet’s powerful auroras – only not in ways the astronomers expected. 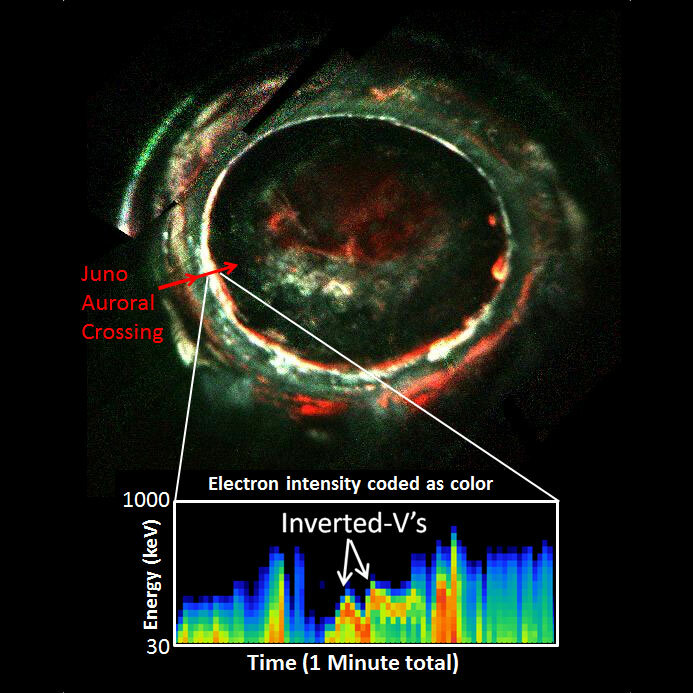 Examining data collected by the ultraviolet spectrograph and energetic-particle detector instruments aboard the Jupiter-orbiting Juno spacecraft, a team led by Barry Mauk of the Johns Hopkins University Applied Physics Laboratory, Laurel, Maryland, observed signatures of powerful electric potentials, aligned with Jupiter’s magnetic field, that accelerate electrons toward the Jovian atmosphere at energies up to 400,000 electron volts. This is 10 to 30 times higher than the largest auroral potentials observed at Earth, where only several thousands of volts are typically needed to generate the most intense auroras — known as discrete auroras — the dazzling, twisting, snake-like northern and southern lights seen in places like Alaska and Canada, northern Europe, and many other northern and southern polar regions. Be the first to comment on "Jupiter’s Powerful Auroras Present a Challenging Mystery"